Three decades of war have left Cambodia with one of the highest numbers of undiscovered landmines in the world. Just last month, 96 unexploded ordnances were discovered on a construction site in the heart Siem Reap town. It is believed that Cambodia’s non-industrialized land still contains between 3 and 5 million explosives. The problem of landmines is often forgotten by visitors of Angkor town. Unfortunately, unexploded ordnance (UXO) from a civil war fought 40 years ago is still widely spread across Cambodia, causing grief and injuries on a daily basis. What’s worse, at least half of the present-day victims of land mines are children. Fortunately, there is an organization that hasn’t ignored this problem, and is tirelessly working behind the scenes to ensure the safety of Cambodia’s people. Last week, we met the Norwegian People’s Aid (NPA), a non-profit organization working on humanitarian disarmament projects around the world. 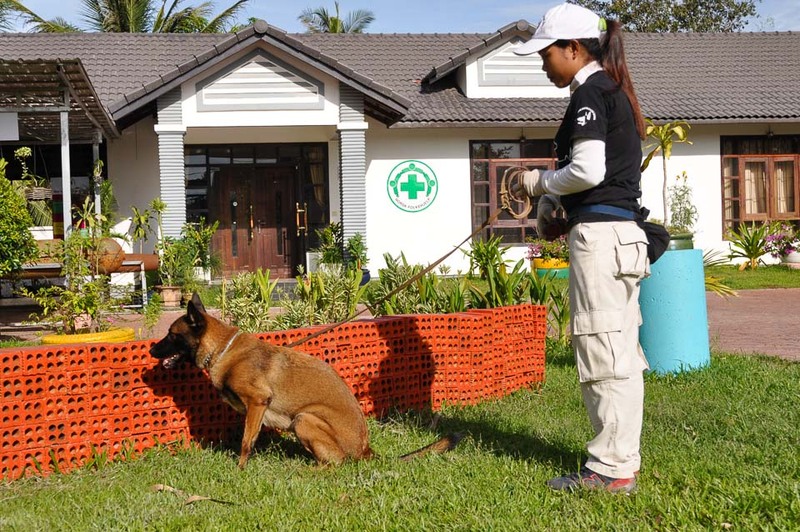 It began actively removing landmines in Cambodia in 1992, and has since cleared over 49 million square meters of land, with the help of their highly trained demining dogs. Incredibly, not a single demining dog has died in the field during this time! With the launch of Siem Reap’s first Explosive Detection Dog Show, NPA wants to create awareness around this often forgotten problem. 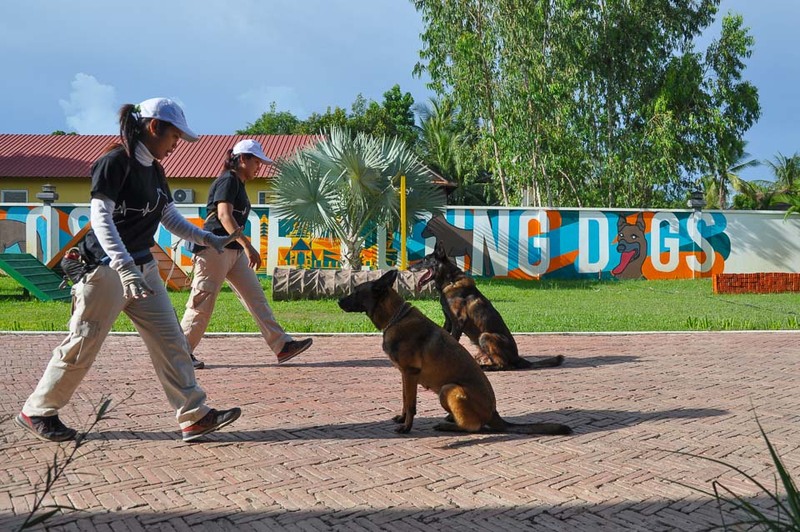 Tourists and locals alike can now experience first-hand how detection dogs help to protect Cambodian lives by clearing landmines and unexploded bombs across the country. It’s not just another brick in the wall when you have to find the one hiding a piece of TNT explosives. But why does NPA use dogs to clear landmines? NPA specifically chose to work with Malinois dogs, a type of Belgian Shepherd, because this breed of dogs can easily detect the odor of explosives with their exceptional sense of smell. In fact, one team of two search dogs can clear up to 800 square meters of land every single day, which is up to 100 times more than a human deminer can clear in the same time. 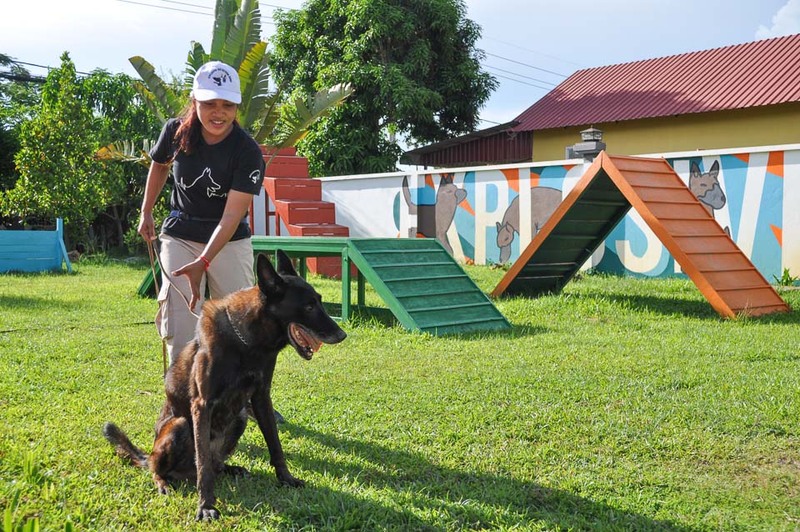 As of this article, NPA is currently training 18 dogs in their Siem Reap training centre, including 8 adorable pups, which were born in May this year. All dogs receive the best possible care by NPA’s full time vet and team of professional trainers. After completing a year of intensive training, the dogs are fully able to begin demining and are deployed into the field, mainly in rural Ratanakiri province. It is NPA’s ultimate goal to make Cambodia completely landmine free by 2025! It is NPA’s ultimate goal to make Cambodia completely landmine free by 2025, a goal that you can actively support by attending Siem Reap’s only Explosive Detection Dog Show! Attending the Explosive Detection Dog Show is a hugely rewarding experience. The show typically starts with a documentary about the impact of unexploded bombs and landmines in Cambodia, followed by a Q&A session with a member of the NPA team. Afterwards, the detection dogs and their handlers are introduced to the audience. We met with Inna and Nergard, both Malinois breeds, and their handlers Srey Noch and Srey Moch. Inna, just 3 years old, has not been in the field yet, but she is incredibly smart and skilled as you will notice during the show. At age 11, Nergard is a true veteran. He has been deployed on demining missions across Jordan, Bosnia and Cambodia, but now enjoys a well-deserved retirement in tropical Siem Reap. With all his experience, sniffing out explosives is a walk in the park for him. Nergard just detected a microscopic piece of TNT explosives, placed amongst the open grass. At the show, Inna and Nergard performed a series of tests. Both the synchronized obedience test and agility obstacle course are a joy to see, but what really stuck in our minds is the explosive detection test! In this test, both dogs display actual search techniques used in the field. In no time, they sniff out two microscopic pieces of TNT explosives, one hidden in a brick wall and another one placed amongst the open grass. Impressive! Once the show is over, you’ll have the opportunity to mingle with the dogs, which are super social and love being around people. You are allowed to pet them and they’ll even pose for a selfie with you! You’re also invited to visit the small souvenir shop and museum, displaying pictures of NPA’s demining missions across Cambodia and some unearthed unexploded ordnance dating back to the civil war. The Explosive Detection Dog Show offers a unique experience for people of all ages. By attending the show, you not only get to enjoy this remarkable and educational event, but you also support a great cause, as all proceeds go to NPA’s dog training centre and projects around Cambodia. Inna and Nergard performing a synchronized obedience test together with their handlers. 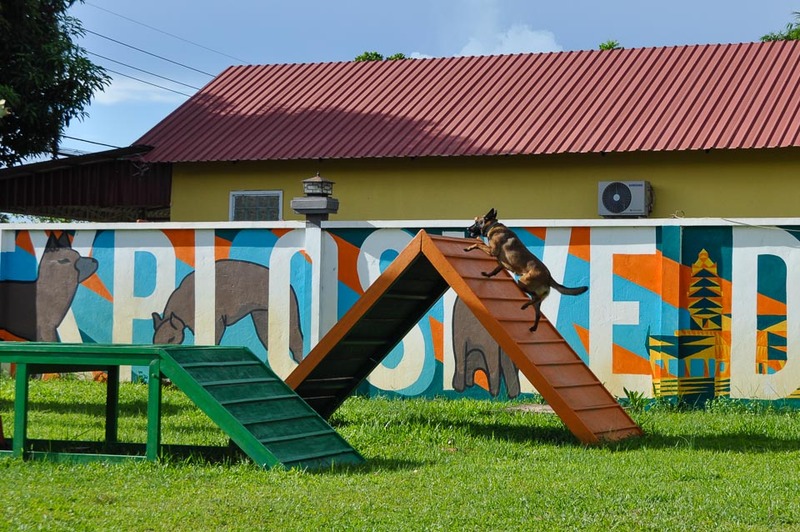 The Explosive Detection Dog Show is conveniently located near Siem Reap’s International Airport. And since it’s on the way to the Angkor Archaeological Park , the show can be perfectly combined with a visit to these ancient temples. Performances are twice daily, Monday – Friday. Mornings at 8.30am and afternoons at 4pm. (These times are chosen to protect the dogs from the tropical heat during daytime.) The visit and show will take around 1 hour. Tickets can be booked online or purchased on arrival at the dog show center. Admission is only US $7 per person (US $3 for Khmers). More info can be found at https://explosivedetectiondogs.org/.